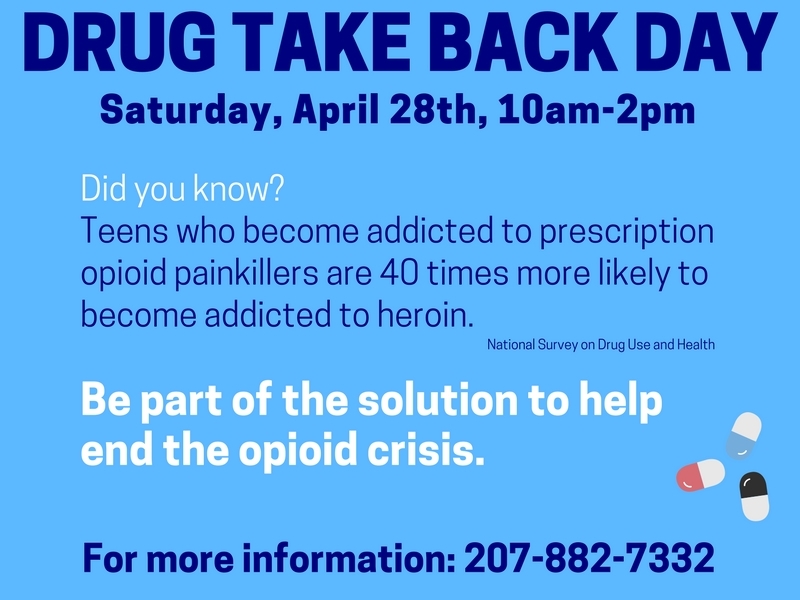 On Saturday, April 28, from 10 a.m.to 2 p.m. the Lincoln County Sheriff's Office along with the police departments of Boothbay Harbor, Damariscotta, Waldoboro, and Wiscasset will host the semi-annual Drug Take Back Day. This medication disposal event has been offered every spring and fall for the last 8 years with a goal to prevent prescription drug misuse and theft. Everyone is invited to bring in expired, unused, and unwanted prescription drugs for safe disposal, no questions asked. This national event is sponsored by the Drug Enforcement Agency, local law enforcement and community health partners. The service is free and anonymous. The DEA can accept all unused, unwanted or expired prescription or over-the-counter medications. This includes pills, liquids, ointments and patches. The DEA cannot accept needles, other sharps, syringes, electronic devices or devices with mercury. Last October, over 580 pounds of prescription drugs were returned to Lincoln County disposal sites, which is a 79% increase from the April 2017 event. The State of Maine collected 41,700 pounds, which is a 54% increase from the previous event. Nationally, The DEA recorded a record-setting 912,305 pounds, or 456 tons of potentially dangerous unwanted medications at more than 5,300 collection sites. That is an increase of six tons from October 2017's collection day. "This increased participation not only demonstrates the excessive amount of medications that linger in homes, but also shows the country's support against the opioid epidemic. Unused medications in home cabinets are highly susceptible to diversion, misuse, and abuse," says Kate Marone, Director of Healthy Lincoln County. Rates of opioid-related deaths and prescription drug abuse in the U.S. are alarmingly high, as are the number of accidental poisonings due to drugs. Studies show that 2 out of 3 teenagers who misused pain relievers say they got them from family and friends, including their home's medicine cabinet (Partnership for Drug Free Kids). In addition, Americans are now advised that their usual methods for disposing of unused medicines - flushing them down the toilet or throwing them in the trash - both pose potential safety and health hazards to humans and to our natural resources. The preferred methods for disposal are at a DEA disposal event, your local law enforcement station or in drug-deactivating envelopes. For more information about the disposal of prescription drugs or about the April 28 Take Back Day event, go to the DEA Take Back Day Website or call the Lincoln County Sheriff's Office at 207-882-7332.